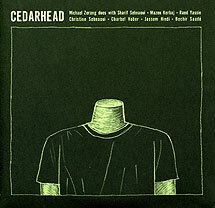 Michael Zerang, drums, darbuka, percussion; Sharif Sehnaoui, electric guitar; Mazen Kerbaj, trumpet; Raed Yassin, tapes, electronics; Christine Sehnaoui, alto saxophone; Charbel Haber, electric guitar; Jassem, Hindi, electronics; Bechir Saadé, nay. Recorded 3-14 April 2006 at the grand music room of the Bustros Palace, Beirut. Front cover artwork and design (reproduced above) by Mazen Kerbaj.